In this topology, all the computers are connected to a single cable. It is inexpensive and easy to install because all the computers in the network are attached to one single cable. Computers may be easily added or removed from the network. If a problem arises at any point of the cable, the entire network goes down. It tends to slow down under a heavy load. In this topology, troubleshooting could be difficult. In this topology, all the computers are connected to switch/hub. It is easy to add or remove computers from this topology. If one link fails in the network, the other workstations are not affected. In this topology, very high transmission rates are possible. It the central switch/hub fails, the whole network goes down. Long cable length is required since each device is directly connected to the hub/switch. It may be costly to install since long length cable is required. In this topology, all the computers or devices are connected to each other in a closed loop by single communication cable. Data transfer takes place in one direction from one node to another around the ring. It is also called loop network. Each computer does not have to depend on the central device as each computer controls transmission to and from itself. It has short cable connection which increases network reliability. It supports very high data transmission rate. It is difficult to change network structure. If a single computer fails, at least a portion of the network won't work. It is a point to point connection between every device in the network. Failure of a device does not affect the data transmission to the destination device. It is difficult to set up. It is more expensive than other topology. 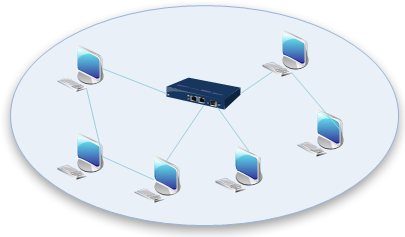 The arrangement or connection patterns of computers or nodes or devices used in the network is known as network topology. 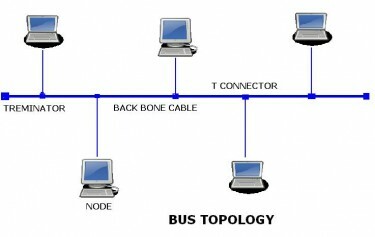 In a bus topology, all the computers are connected to a single cable. 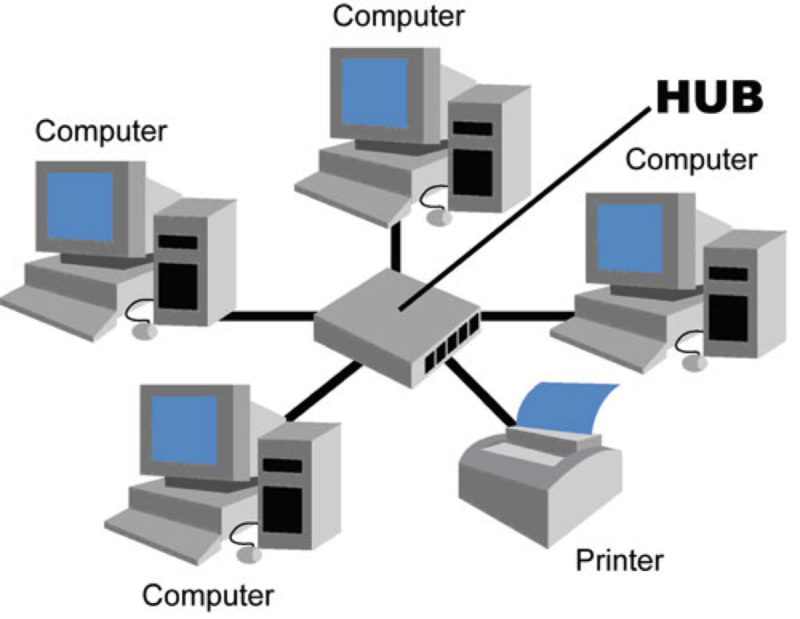 In a star topology, all the computers are connected to switch/hub. 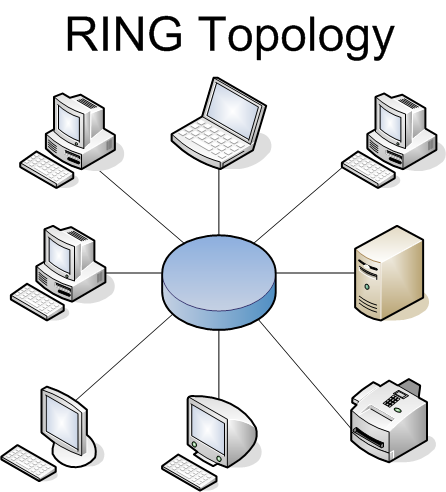 In a ring topology, all the computers or devices are connected to each other in a closed loop by single communication cable. Mesh topology is a point to point connection between every device in the network. What is network topology? List the three basic topologies. The network topology is the cabling pattern of an interconnection of computers on the network. It can be defined as the physical layout of cabling for connecting computers and other network devices on the network which describe how the computers and networking devices are linked with each other and how they communicate. What is bus topology? List its disadvantages. The topology in which nodes are connected in a daisy chain by a linear sequence of buses which is formed by joining many segments of coaxial cables with BNC jacks and T-connectors is known as bus topology. The entire network does not work if there is a problem in any segment of the network bus. It is difficult to find fault. It provides limited flexibility for change. What is star topology? List its advantages. The star topology is the most popular network topology used to connect computers and other network devices in which nodes are connected to a centrally-located device called hub in the form of a star. If any node fails, it does not affect the remaining portion of the network. It can be extended easily to any size. There is less chance of failure of nodes due to cables, connectors, and other networking devices. Write short notes on Client and Server. A client is a network computer that utilizes the resources of other network computers, including other clients. The client computer has its own processor, memory and storage and can maintain some of its resources and perform its own tasks and processing. A server is a computer on the network which controls and manages other computers on the network. It provides facilities of the sharing of data, software and hardware resources to other computers. The server computer must be the powerful computer having higher processing and storage capacity. Which of the following is not the type of Network Topology? In which topology computers are connected in single cable? In which topology twisted pair cable is used for joining nodes ? In which topology all the computers or devices are connected to each other in a closed loop? Topology in which computer is connected to esch other through a central connecting device. Topology that consists single cable. Any Questions on 'Network Topology '?